One of the most popular requests we get is information on diabetes, high blood sugar, and how a low glycemic nutrition plan can be used for those who are diabetic or pre-diabetic. Now you can review blood sugar chart information to see how blood glucose levels in normal, pre-diabetic, and diabetics interact. What's most useful is for the large number of readers who are pre-diabetic. 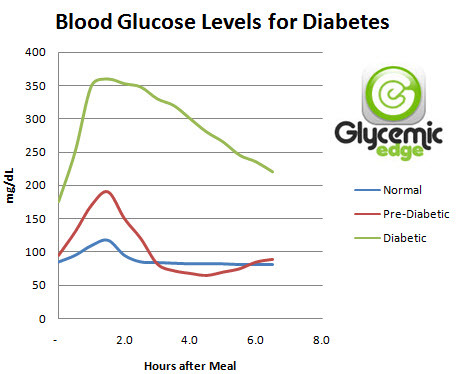 Many don't realize how fine a line there is between the onset of diabetes and "normal" blood glucose levels. This is because the fasting glucose levels for pre-diabetics and non-diabetics is almost the same. This means that for many of us who get regular blood work, the glucose levels can appear 'normal', but you may actually be pre-diabetic or at risk. The best way to check this is to have your blood monitored after a meal, then repeat the test if the results indicate pre-diabetic levels. It's actually not difficult to do and can be a life changing discovery. In the meantime, a low glycemic meal plan offers a lot of benefits well beyond weight management – specifically, a more relaxed and less pronounced spike in blood glucose and the resulting release of insulin. This means a low GI meal plan helps you manage your nutrition and keep your system in natural balance, and can compliment your treatment plan. We'll be adding to our hyerglycemic and hypoglycemic condition and diabetes awareness research shortly. In the meantime, stay healthy and informed!